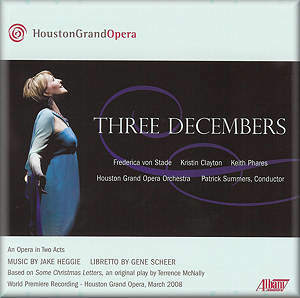 Three Decembers is a chamber opera by Jake Heggie, a composer still best known for his opera Dead Man Walking. Dead Man Walking which had a libretto by the playwright, Terence McNally. This new opera uses a libretto by Gene Scheer based on one of McNally’s plays. The play in question, Some Christmas Letters (and a Couple of Phone Calls), is a short three-hander which McNally wrote for an AIDs benefit in 1999. The operatic role of Madeleine Mitchell was written with Frederica von Stade very much in mind. The work was premiered by Houston Grand Opera in December 2007 and has since gone on to have quite a life in American opera houses. Three Decembers is compact - just two Acts and a short Epilogue - each taking place in a different decade. The opera opens in 1986, Beatrice (Kristin Clayton) and Charlie (Keith Phares) are on the phone discussing their mother’s Christmas letter. Their mother is the famous actress, Madeleine Mitchell (Frederica von Stade) and she is, as usual, away working. This first act explores the relationship between the three of them. The two adult children constantly come back to the thoughts of their absent father, who died in an accident when they were young. Their mother is self-absorbed and randomly negligent of relations. In particular she seems to be unable to accept Charlie’s (male) partner Burt, who is ill with AIDs. The second Act takes place ten years later, after Burt’s funeral. It becomes apparent that there has been some sort of rapprochement and Madeleine had accepted Burt. But it remains unclear whether this was genuine or whether Madeleine had accepted her daughter’s advice - proffered in the first act - to fake it if she couldn’t be genuine. Relations between the three remain tense, and Madeleine is apparently unable to understand why her daughter should be grieving over Burt’s death. Finally, matters blow up and Madeleine admits that their father’s accident was an invention: in reality their father had problems with alcohol and drugs and committed suicide. The Epilogue is a short piece which covers Madeleine’s memorial service and the work ends with the dead Madeleine singing in an ensemble with her children. The piece deals with some pretty tough issues, notably AIDs and the way families deal with secrets. But as the work is based on a Terence McNally play, these issues are dealt with using a great deal of sentimentality. This is reinforced by the melodic nature of Heggie’s music. When the work opens, the overture sounds as if it could be from a musical, and throughout there are teasing pointers in this direction, along with references to music theatre composers like Kurt Weill. But, when called upon to write a real show-tune for Madeleine, Heggie fails to do so. During Act I, we see Madeleine’s act in Barbados and she sings a song from the new musical in which she is appearing. For this Heggie delivers an interesting aria, but one which would probably have been stronger if it had come out as a full blown show-stopper. There are a number of hummable melodies in the opera, but often these occur in the more complex areas of the plot. Frankly I would have liked a little more acid, both in the music and in the delivery, so as to balance the sweetness. Heggie and Scheer deal with the Big Issues, but never quite manage to dig deep enough for me. As Madeleine Mitchell, Frederica von Stade is undoubtedly charismatic and sings Heggie’s music beautifully. But I kept wondering what the role would sound like if performed by a singing actress, rather than a singer who can act; someone like Elaine Stritch or Julia Mackenzie came to mind. If Madeleine Mitchell was played by one of the Golden Girls then she ought to be played by Bea Arthur’s acid-tongued Dorothy or Betty White’s self-absorbed, man-eating Blanche; but on this disc she seems to be played by Rue McClanahan’s soft-edged Rose. Keith Phares and Kristin Clayton do sterling work as Charlie and Beatrice. There is a lot of conversation in the opera. Phares, Clayton and von Stade make it work naturally, so that the dialogue flows and the big numbers arise out of it. Though that doesn't disguise that the libretto seems to have a lot of words to get through. There is a big draw-back when listening on disc. Though von Stade is a mezzo-soprano, she was always quite a light one, and Clayton has a rather similar vibrato laden voice so that the two sound rather too similar. On my first listen-through, without looking at the libretto, I found that I got the two confused. The piece would work far better on disc if Clayton had had a more focused, less vibrato-laden, younger-sounding voice. The singers are accompanied by an eleven-piece ensemble drawn from the Houston Grand Opera Orchestra, with pianos played by Patrick Summers and Jake Heggie. They play Heggie’s music with a will and accompany in a convincing and appropriate manner. The CD booklet includes a complete libretto, which you may well need as the diction is decent without being superb, plus some production photos and a number of interesting essays from Patrick Summers, Jake Heggie and Gene Scheers. This was an opera that I wanted to like better, but just couldn’t, no matter how hard I tried. It is tuneful and accessible and is here given in a committed performance. However, both music and performance would have benefited from a little more grit.